Adam Kovacevich, author of the DC PR blog Potomac Flacks and former Dittus Assistant VP, must have got good grades in college. He will be joining Google as their DC spokesperson next week. Adam's fancy suits belie the fact that he is a tech policy geek at heart. He should do well at Google. 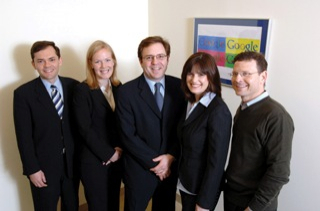 Adam will be working with former Clinton speechwriter Bob Boorstin, who joined the company last May, and the rest of the Googley crew pictured below for a "Google in DC" piece that ran yesterday in The Politico. For those scoring at home, you can add this one to the list of similar stories that we compiled last September. I can't imagine he'd have anything of real value considering how he lived...And the people who would purchase mementos of his evil due to some perverse interest or to amaze the folks at the bar b que next Sunday are just inviting those demons in. Outstanding post, it's a shame most people won't get it. Harry's Ghost is right, we are too big for our britches now. We have become the British Empire and these wars will take us down as a nation. The poor have nothing to lose but it's a real pity the middle class has to go down. I would also note that the volunteers seem to come overwhelming from smaller towns that have taken the biggest hits in the modern service economy. This future service allows the customer to save money on energy costs while enabling more efficient use of the electric grid. I was just imagine about it and you provided me the correct information I really bookmark it, for further reading, So thanks for sharing the information. May I just say what a comfort to find somebody that really understands what they are talking about on the net. You actually realize how to bring a problem to light and make it important. More and more people ought to check this out and understand this side of your story. It's surprising you aren't more popular given that you definitely possess the gift. I blog often and I really appreciate your content. Your article has truly peaked my interest. I am going to bookmark your website and keep checking for new details about once per week. I subscribed to your RSS feed as well. I really like your writing style, excellent info, regards for posting :D. "Much unhappiness has come into the world because of bewilderment and things left unsaid." by Feodor Mikhailovich Dostoyevsky. This is the right website for everyone who wants to understand this topic. You know so much its almost tough to argue with you (not that I personally would want to…HaHa). You certainly put a fresh spin on a subject that has been written about for decades. Great stuff, just great! you may have an amazing blog right here! would you like to make some invite posts on my blog? Having read this I thought it was rather enlightening. I appreciate you finding the time and energy to put this informative article together. I once again find myself personally spending a significant amount of time both reading and posting comments. But so what, it was still worthwhile!